Chapter 24 / Section 1 - What is Responsive Design? There are many design philosophies that have been adopted by web developers and website designers over the years, and many of these have been responding to a need or a demand from web users. Responsive web design is a concept that has developed because of an increasing number of web users that are using different types of devices to access online content. The range of devices that can be used to access the web is also increasing, with cell phones and tablets being added to with innovative products such as smart-watches and even glasses that can be used to access online content, meaning that this type of design is likely to become even more popular. The most important thing to consider when creating a site with this design philosophy is that the website should be able to be viewed on a variety of different screens and devices. This is achieved by making sure that the website isn't one of fixed sizes and pixels, but rather that the page can be scaled down or up depending on the size of the screen of the device that is being used to access the content. The responsive aspect of the design is that the website's programming includes an intelligent aspect which identifies the type of device or browsing software people are using to access the site, and then adapts the experience to match their needs. The best aspect of using responsive web design is that it means the user doesn't need to worry about the type of device or software that they are using to access the content of the website. This gives them a much better experience, and will also allow them to access the content in the way that is most convenient for them, and this is vital to the new type of internet access that users demand. There are so many websites online that it is easy for a web user to find an alternative, so responsive design helps to make sure that they don't need to look for alternatives. At the heart of this type of design is a fluid grid which will then be used to scale the website up or down depending on the type of device being used to access the site. This will also be used when presenting pictures to users, as these will also be scaled up and down to suit the type of software being used to display the website. Most web designers will begin by building basic websites, and then add the enhanced features that will be displayed by desktop computers and smart phones. Giving web users a great experience is a win-win situation for website owners, and responsive design will allow different web users accessing the site through different devices to get a suitable experience. With increasing numbers of sales and web users making purchases using tablet computers and cell phones, being able to access that potential marketplace could make a big difference to the overall success of the business or trader who owns the website. *RC Website Group’s Free Responsive Design Tester is a useful tool for your website! 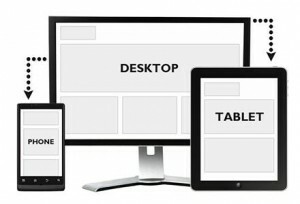 Our Free Responsive Design Tester reflects what your website looks like on different screen sizes. Our Free Responsive Design Tester is just the start to your Website Redesign discussion. After using our Free Responsive Design Tester, continue the conversation with one of RC Website Group’s Website Specialist. We will provide you a quality website that is also smart phone friendly.